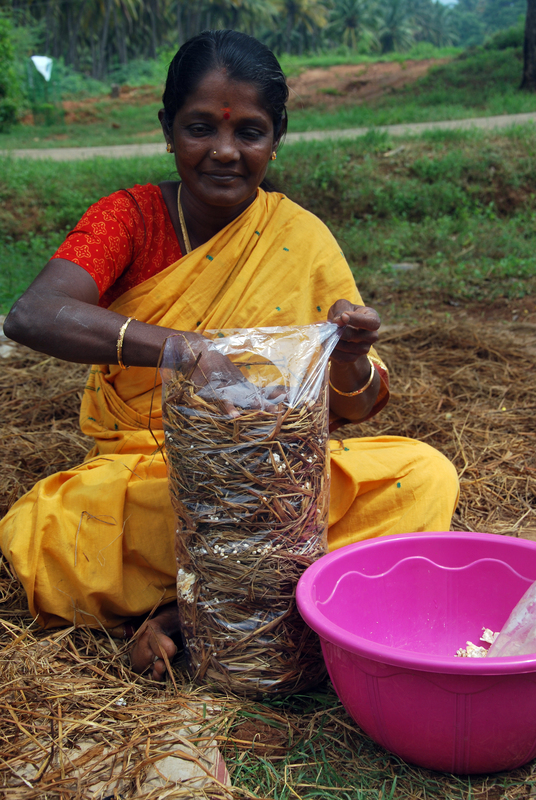 7weeks in India – Female tribal self-help groups building their own future – Go India, go future! 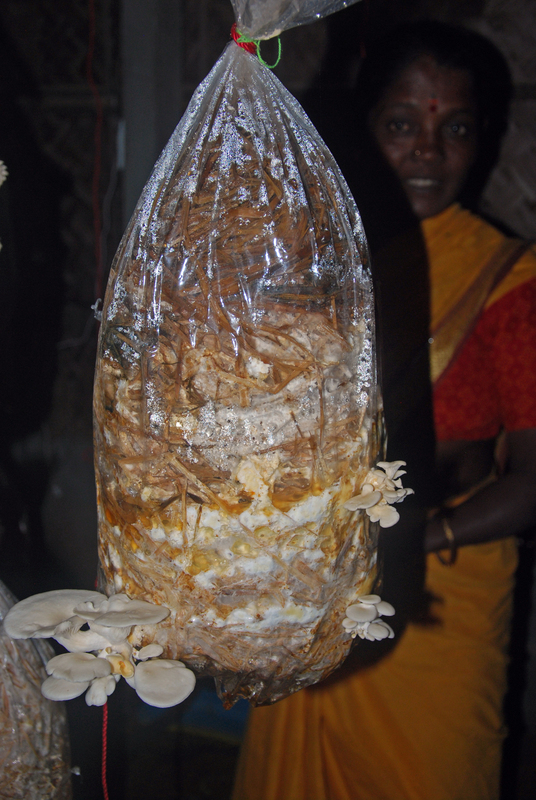 The mushroom cultivation – it is just one small business idea for poor women that could lead to a different way of life. When we enter the tribal village most of the women are working on the right and the left of a small muddy road that takes us to the mushroom cultivation facility. Day-workers. They are cutting woods and plants, an activity offered by the government. A kind of 100 days per year aid program: offering to those who have nothing; at least a very few rupees per day enabling the poor to buy the most basics things in life. Not more, not less. A bridge has been built, too – so that people can pass when they come back from school or work and the river is flooded. In the earlier times they just had to wait when the water separated the road from their village, sometimes many hours before they could reach their houses. Some land has been given to these women and yes, TV and water for free. There is a lot of land around, but most of it is private land. Tribals are not allowed to use and cultivate it. But now – with the mushroom facility – there is an additional source of income.An income that can become more, if the business develops. The piece of land given by the government is essential for the mushroom facility. Here the village people – with support of a NGO – could construct a mushroom house, covered with a corrugated iron roof and a small stone wall. The house is covered with leaves – these leaves are necessary to ensure that the temperature inside gets never higher than 28° – otherwise the mushrooms would not grow. Inside it is dark. And water hand-pump is there to spread water on the soil, a thermostat and a scale with some iron weights. From the roof there are about 40 simple washing lines hanging down. All ordered in 5 or 6 parallel rows. On most of them there is plastic bundle attached, filled with straw and seeds. It takes about a week before the mushrooms can be cropped. The mushrooms are sold in the surroundings. The demand is high, it is one of the first mushroom delivery in this area. They started just a year ago. Some women show me also proudly their certificate they got when they went to a training to learn how to cultivate the mushrooms. And they are learning by doing. The daily crop is growing. 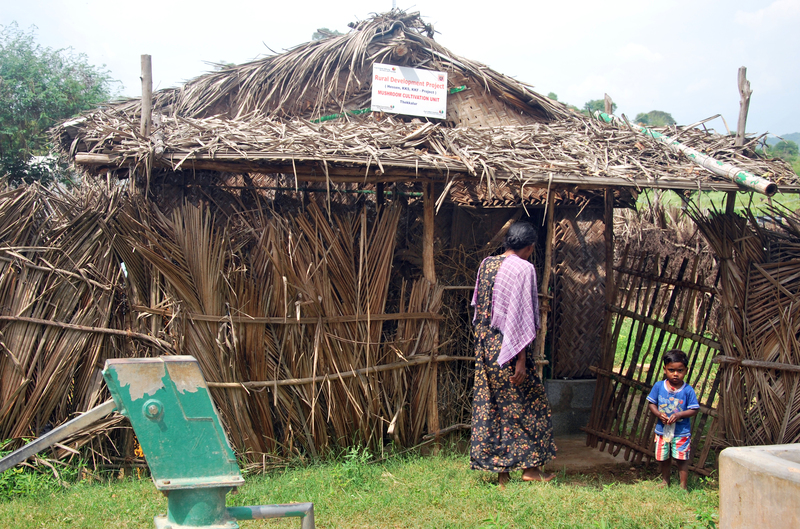 However, they are still at the beginning: The women are organized in self-help groups (SHG). Around 15 people each and a total of 4 groups. Every SHG can do the mushroom cultivation for one month. Then it is the turn of the next group: raw material ordering – seeding – cultivation – crop – sales. They show me several books how they manage all, also the customer tracking, for marketing reasons. Very transparent, very detailed. Before they started this activity they got business training. The money they gain is saved within the self- help group itself, some monthly member contributions are added (20 Cents/month). So, they are able to bring a certain amount of money to the bank and to finance some small loans for their members in case of necessity outof their savings. Their biggest dream? “One day,” they say, “we want to run a small business on our own, each women one. E.g. a grocery or fruit shop.” But it will take still some time. After two years now they have saved as much as an average European spends when he has dinner in three, in a middleclass restaurant. However, the first step is taken. SInce a few months they can get also personal loans, the half amount of what is available via their personal saving books. The way is open to first investments in a better future. I have bought one mushroom portion and tasted it later on. Really delicious!